Seriously, I can’t count the number of pieces I have read over the years suggesting that we have to eat a certain way to protect the environment. What most pussyfoot around is the big, proverbial elephant in the room- overpopulation first seriously for better or worse discussed at length by Paul R. Ehrlich in his landmark book the Population Bomb in 1968. If there ever was one subject ranked numero uno on the taboo list of what not to write about in association with climate change this is it. In the world of politics some pundits won’t touch abortion, which is part of the issue of overpopulation. When does human life really begin…when sperm meets egg, or later? I’m not going to get into a discussion about the morality or immorality of abortion, just suffice it to say that I believe that when a child is brought into this world it should have the best environmental, parental, and social structure possible throughout the duration of its life. That being written, sometime in the not too distant future children are going to be suffering the ravages of what is now preventable climate change, if they haven’t already in countries like Syria, should carbon emissions continue unabated. So today I’m going to state a very inconvenient fact. The more people on the planet the worse climate change will be. Each of us is responsible for using resources through the course of our lives requiring energy, which up to this point in history has been mostly generated by fossil fuels. The key to sustainability is generating enough green energy for a given, finite number of people whether it be just a few million or well more than 10 billion. That’s not to write that we should get rid of several billion people all at once, heaven forbid, just that through education and some tweaking of social mores the Earths population can either stabilize or slowly go down. As stated, once a person is born they have the right to the best life possible, provided that they earn it, of course. Overcrowding, though, can make that possibility of a good life very dim. Even if there was not a climate crisis overpopulation in some areas around the planet is a big problem. Ask yourself this question. Are homo sapiens better and smarter than fruit flies in a jar? When I was a kid one of my science experiments was to place two fruit flies in a Mason jar along with some decaying fruit serving as a food supply. Within a couple of days the jar was full of flies happily flying around their little glass cage. A couple of days after that though, either the food was all used up and/or the flies ran out of oxygen, and all were dead. Granted, we can grow food, and plants help to recycle the atmosphere, but can we sustain life in our closed jar, Earth? A reduction in birth rates would be very beneficial, but curbing births is not supported by many religious views. The planet’s population should reach ten billion by about 2050 barring horrendous wars and disease. From my own personal perspective life begins at conception, so preventing unwanted pregnancies begins and ends with birth control techniques. As a global society, sooner or later, we will encounter barriers to population growth that may be very unpleasant for those living in future times. Perhaps due to changes in society from America to Europe to China and India population may peak at around ten billion then naturally, as many have suggested during the second half of the 21st century mainly due to the education of women, then decline. Many parents have more than two children to guarantee that they will be taken care of in old age. Perhaps if societies took care of the elderly better there would be no need for larger families. Will societies want to put a tax on more than two children per family just like carbon taxes are being considered in the current day? Hopefully not, but pressures to do so I’m sure will mount with time. Remember the Chinese one child per family ruling? Well, lead balloons do not fly. By the 1970s, overpopulation hysteria came fully back into vogue. Stanford University biologist Paul Ehrlich published The Population Bomb in 1968, which opened with the lines, “The battle to feed all of humanity is over. In the 1970s hundreds of millions of people will starve to death in spite of any crash programs embarked upon now.” Shortly thereafter, in 1972, the Club of Rome issued a report called The Limits to Growth. It bolstered the old argument that population growth would deplete resources and lead to a collapse of society with evidence from computer simulations based on dubious assumptions. Those jeremiads led to human rights abuses including millions of forced sterilizations in Mexico, Bolivia, Peru, Indonesia, Bangladesh and India, as well as China’s draconian one-child (now two-child) policy. In 1975, officials sterilized 8 million men and women in India alone. Were these human rights abuses necessary? No. Instead of facing widespread starvation and resource shortages, humanity managed to make resources more plentiful by using them more efficiently, increasing the supply and developing substitutes. Today the population is at a record high, and famines have all but vanished outside of war zones. Even in Sub Saharan Africa, the poorest area on the planet, the food supply now exceeds the recommended 2,000 calories per person per day. Yet overpopulation fears still exert a powerful hold on the public imagination. Earlier this year, a survey by Negative Population Growth found that “American high school students are very worried about overpopulation.” Many prominent environmentalists — from Johns Hopkins University bioethicist Travis Rieder to entertainer Bill Nye “The Science Guy” — support tax penalties or other state-imposed punishments for having “too many” children. Bowdoin College’s Sarah Conly published a book in 2016 through Oxford University Press advocating a “one-child” policy, claiming it is “morally permissible” for the government to limit family sizes through force to prevent overpopulation. 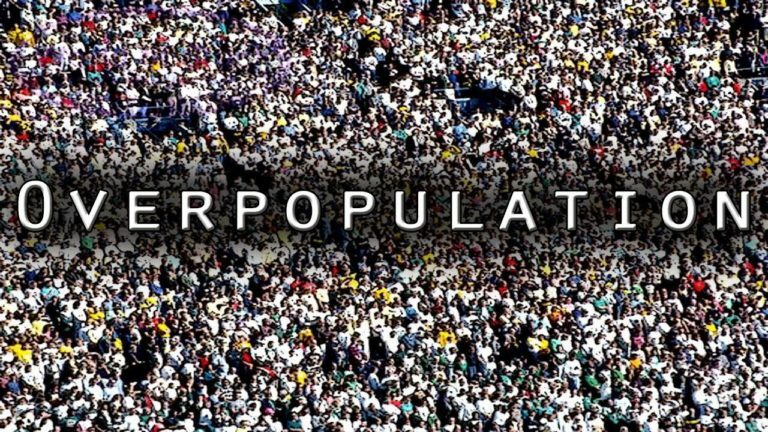 Even if overpopulation were to prove to be a problem, it is one with an expiration date: due to falling global birth rates, demographers estimate the world population will decrease in the long run, after peaking around the year 2070. It is now well-documented that as countries grow richer, and people escape poverty, they opt for smaller families — a phenomenon called the fertility transition. It is almost unheard of for a country to maintain a high fertility rate after it passes about $5,000 in per-person annual income. Alarmism and extreme measures to combat “overpopulation” are entirely unnecessary. I wonder if the human race will be like fruit flies in a jar, using up resources, not capable of adapting to a changing world. We currently are asking ourselves if we want to live in a green world with less people, or a brown, crowded planet experiencing short, cruel, and brutish lives, as envisioned by philosopher Thomas Hobbes. The choice is ours to make now. As it’s headed to -34 degrees here this week, I may even read it again as I refill the wood stove!